Unlike its rival in Cupertino, California, Microsoft will reportedly be relying on traditional DVDs and USB flash drives to distribute its new Windows 10 operating system. Apple, on the other hand, has scrapped distributing its OS X software using physical media, instead opting to rely on internet downloads through the Mac App Store. Offering Windows 10 on USB flash drives will be beneficial to customers who have purchased a new Windows notebook in the past few years. As reliance on optical disk drives declines, manufacturers have dropped the DVD-ROM or CD-ROM drives on many systems, including thin and popular Ultrabooks, hybrid convertibles and the emerging PC-on-a-stick category. 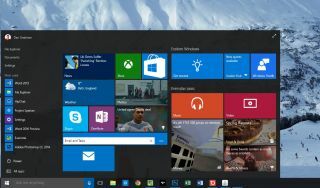 Previously, Microsoft announced that Windows 10 will be available to consumers starting July 29. Windows 10 will be available as a free upgrade for consumers upgrading from Windows 7, 8 or 8.1 during the first year of release. If you're ineligible for the free upgrade promotion, there will be two versions of the operating system at retail – Windows 10 Home and Windows 10 Pro. The Home version will cost $119 (£75, AU$153), while the Pro version will retail for $199 (£126, AU$257). Home users wishing to upgrade to the Pro version will need to pay an additional $99 (£62, AU$128). According to Winfuture.de, the cost of Windows 10 distributed on a USB stick or USB flash drive will be the same as the digital download and DVD versions. The benefit of choosing the USB method is that both the 32-bit and 64-bit versions of the operating system are preloaded on the memory drive. This means that consumers can choose which version they want when they install. With the DVD version, consumers must choose if they want 32- or 64-bit system at the time of purchase, and they can't change their minds later. Microsoft has not given any details about its distribution plans for Windows 10 at this point. We've reached out to the company for comment about the USB distribution method and are awaiting comment. Windows 10 Enterprise will not be part of the free first year promotion, and business users can upgrade through Windows Assurance. The software also brings more flexibility to IT administrators in deploying future upgrades and features.